Day - This serum contains 5 plant extracts, and is enriched with Vitamin-E-rich Hyaluronic Acid to moisturize and "fill" wrinkles. The skin is left radiant, plump and fresh. Jojoba oil has been added for nourishment and moisture, which keeps the skin free of irritation. From the product description: "Sea Mayweed — a marine bio-ingredient acts as a true skin prebiotic — it promotes microcirculation, soothes the skin and lastingly optimizes its natural balance." Night - Along with the same Hyaluronic Acid, the night serum is also formulated with natural AHA and BHA. From the product description: "This natural AHA is made of citrus and maple sugar that coat and improve the skin. BHA extracts from White Willow Bark promote cell renewal and impairs the skin's aging process. Witch Hazel Floral Water tones and soothes, along with German Chamomile extract, an exceptional skin revitalizing agent. The skin becomes visibly balanced, hydrated and more supple, rested, silky and glowing." You can see in this photo that the day serum, on the left, is a thinner consistency and contains some shimmer particles. The nighttime serum is a different consistency for sure - a bit thicker and translucent. After cleansing, I'll apply a witch hazel based toner and follow up with one of these serums. I usually don't need any added moisture in the morning, since I only use warm water to cleanse, but I will add a light moisturizer once the nighttime serum has been absorbed. There's something to be said about the "natural" claim. Now I'm no nature police, but I really appreciate when products are made from plant-based ingredients. 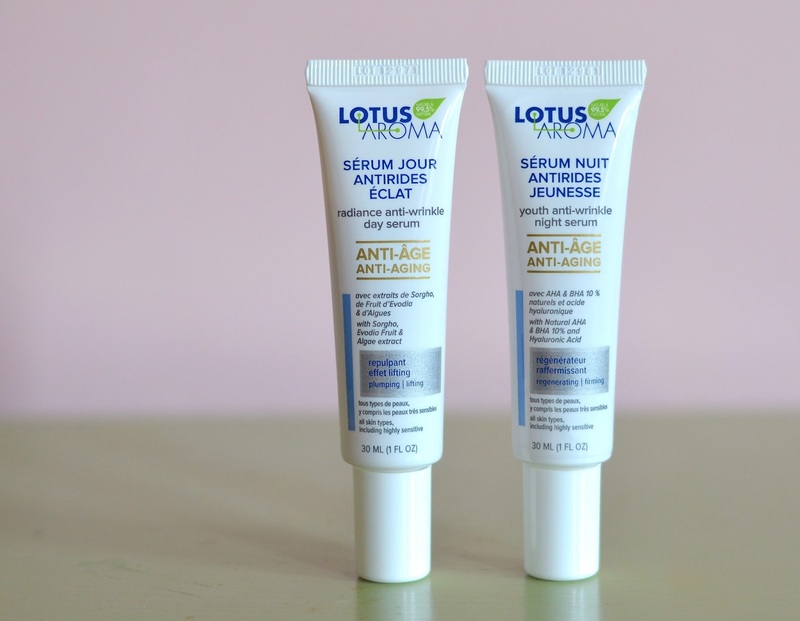 Lotus Aroma is a homegrown Canadian brand- a division of the Quebec-based skincare Laboratory DermoLab Pharma. It's comforting to know that the lotions and potions I'm applying to my skin are safe, and free from unnecessary chemicals. At around $45 per tube, these serums are a small investment. When compared to other high-end anti-aging products with similar ingredients and claims, they are definitely a more affordable option. For a list of local health food/nutrition stores which carry the brand, you can use their "retailers" feature on the site, linked here. I'm a big fan of these serums and will continue to incorporate them into my routine. Though I don't have many skincare concerns, I have noticed an increase in the overall brightness and evenness of my complexion when using these serums. Blemishes disappear faster and makeup looks more radiant. When it comes to treatments, I still use my Paula's Choice BHA liquid and foam, but not in conjunction with the night serum. I would not recommend experimenting too much with chemical exfoliants, so stick to one product and see how it works over a few weeks before making any changes.